I have gushed enthusiastically about director Norman Foster on many occasions – the great, unsung stylist who not only brought us the best of the great Mr. Moto series, energized the Sidney Toler Chan series, gave the world some fine noir pictures and even delivered great television such as Disney’s “Davy Crockett” series. He is truly a filmmaker worth gushing about. 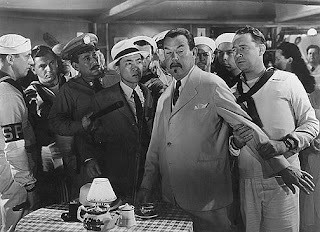 “Charlie Chan in Panama” crackles with excitement and it bears Mr. Foster’s exquisite individual stamp of distinctive, varied and always-effective key lighting, his rich and crammed to the brim frame compositions and pacing (in narrative, action and dialogue) that careens with the ferocity of a rollercoaster. Foster always delivered the goods and this picture is no exception as it is, along with “Charlie Chan at Treasure Island”. truly one of the greatest Chan pictures. Along with Erle Ford’s delightful “Charlie Chan’s Murder Cruise” and Lynn Shores’s eerie “Charlie Chan at the Wax Museum”, this thrilling Panamanian-set mystery adventure is one of three terrific Chan pictures released by 20th Century-Fox in 1940. It is also a wonderful entry in the various series-styled pictures that brought their heroes into the world of war and espionage. During this time it was not uncommon for characters such as Tarzan and even Sherlock Holmes to be in the thick of battling Nazis and other assorted evil threats to the American – and by extension, democratic Western way of life. Here we have Chan assisting the American “secret service” to thwart a potential terrorist action to destroy the Panama Canal. Sidney Toler, the more genial Chan thespian to the fabulous, but decidedly more dour Warner Oland, is on undercover assignment in the guise of an Asian entrepreneur who runs a small shop specializing in – I kid you not – Panama hats. A murder occurs right in Chan’s store that sets the wheels in motion for an action-packed and downright suspenseful mystery-thriller set against an exotic world of back-alley stores and markets as well as a nightclub jammed with American and European expatriates (pre-dating, but not unlike Rick’s Café Americain in “Casablanca”). That Foster comes close to recreating this world semi-realistically on a Fox back-lot is one of many testaments to his considerable prowess as a filmmaker. The Chan pictures are always replete with magnificent acting. Toler, as usual, delivers Chan’s Cheshire grin and epigrammatic sayings with humour and considerable aplomb. Sen Young, also as per usual, bungles about hilariously as Number Two Son Jimmy. The supporting cast offers the expected delicious mixture and we are treated to yet another appearance from the demented Lionel Atwill (“Son of Frankenstein’s” oft-parodied wooden-armed Inspector Krogh) as a novelist with more than a few secrets. Jean Rogers, the luscious beauty queen and former “Flash Gordon” (1936) Dale Arden appears as a slinky songstress with a mysterious past and lest we forget, “Charlie Chan in Panama” features the ever-delicious scumbag Jack La Rue as the sleazy club owner Manolo who is blackmailing the aforementioned dish into spying. All in all, “Charlie Chan in Panama” is a first-rate entry in the Chan series – so much so that one does wish that Foster and his numerous collaborators had more critical and awards recognition. At the end of the day, however, they had the greatest recognition of all – audiences. With this film and many others, Foster and company generated hit after hit – proving, of course, that audience recognition should ultimately be the highest form of recognition for filmmakers. Who else would and should they be making pictures for if not the audience? “Charlie Chan in Panama” is available on DVD as part of Volume 5 of the Charlie Chan Cinema Classics Collection from 20th Century-Fox Home Entertainment.